The new Twisted Hobbys Crack Yak 55 "Lite" is a fast-build indoor EPP profile model with pre-hinged control surfaces complete with undercarriage, control horns, push rods, wheels/pants, wing spar and links. 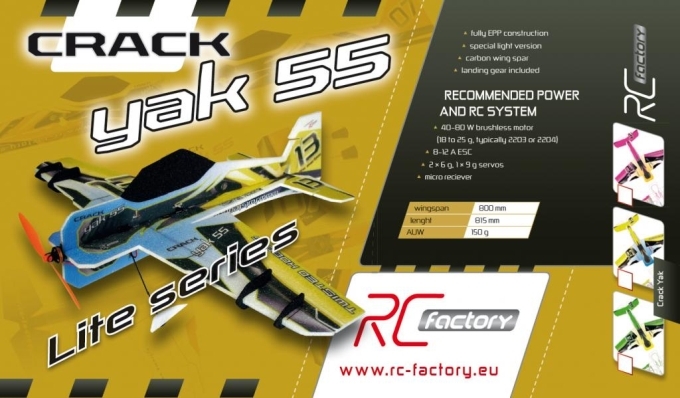 These new Lite versions of the Crack Yak are designed to be built fast and offer something for the experienced indoor RC pilot looking for a resilient airframe free from the repairs associated with depron models, whilst still providing the incredible flight characteristics of the original Crack Yak 55 models. The Crack Yak 55 Lite has a target weight of 150-175 and requires a 50-70W brushless motor with appropriate ESC and propeller. Three servos are required (aileron, rudder and elevator) and recommended are 2×4g and 1×9g servo. A 2s/7.4V lithium polymer battery from 350mAh to 450mAh is recommended. For assembly, use either UHU Por or Medium CA and Kicker according to your preference. Foam-safe CA is not required. This is the first plane I have flown after 6 years of being out of the hobby and it is simply awesome. After doing a relatively rushed build (4 hours) I was prop hanging this thing in the back garden. Didn't even trim it and I'm pretty sure the glue was still wet but it was just torque rolling by itself. It came out at about 190g which is a bit overweight but I went overboard and used epoxy on the motor mount and landing gear and was generally a bit generous with glue. I think you could use D561s all round, maybe even lighter servos on the tail and you could easily get to the ideal weight. Incredible plane, and fantastic service.